Want to fry up the doughnuts with cinnamon sugar and mascarpone that Food Network star Giada De Laurentiis called the "best thing I ever ate"? Are you pining for the peanut butter sandwich cookie recipe that legendary writer Nora Ephron proclaimed "the greatest cookie ever ever ever"? Do you long to dazzle friends with the triple coconut cream pie that New York food writer and Serious Eats founder Ed Levine called "one of the best pies in the country"? Or do you just want to get your hands on the crazy-rich, streusel-topped monkey bread with caramel dipping sauce that has people lining up outside the Dahlia Bakery's door? 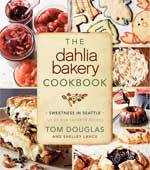 Now, those sweet dreams can come true, thanks to The Dahlia Bakery Cookbook. 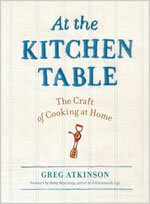 This is a book of more than two dozen essays about eating, food, the meaning of coming together at the table, and the pleasures of home cooking. Greg Atkinson, chef and writer, brings the perspective of one who has harvested shellfish with fishermen in Puget Sound, walked the rows during harvest at Oregon vineyards, as well as sourced ingredients at the local big box retailer. According to Atkinson, the measure that’s most valuable is the amount of heart that brings people together for a meal—less important is the pedigree of the extra virgin olive oil that's used. From sinking a seed into the soil through to sitting down to enjoy a meal made with vegetables and fruits harvested right outside your back door, this gorgeous kitchen gardening book is filled with practical, useful information for both novices and seasoned gardeners alike. 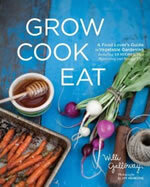 Grow Cook Eat will inspire people who already buy fresh, seasonal, local, organic food to grow the food they love to eat. Street food has redefined the landscape of American restaurants, and Skillet Street Food is considered to be one of the top gourmet food trucks in the nation. Armed with a shiny Airstream trailer and a devoted lunch crowd, it has helped turn the food truck trend into a lasting movement. Raising the bar from tacos and hot dogs to truly gourmet bistro fare, such as poutine and deconstructed corned beef hash, chef Josh Henderson has created an empire out of his simple dream: to feed people delicious and satisfying food on the street when they need it.